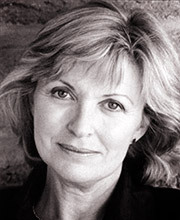 Hannah Gordon is most remembered for her television appearances which include Upstairs Downstairs, My Wife Next Door, Joint Account and Telford’s Change, as well as starring roles in The Country Girl, An Ideal Husband, The Aspen Papers and numerous West End theatre productions. Her voice has reached an even wider audience through her extensive radio work and many audiobooks. She has also presented the hugely successful painting programme Watercolour Challenge on Channel 4.